The White House blasted Senate Republicans’ open letter to Iran on Monday, comparing it to “efforts of neocons in the previous administration” to prefer military options over diplomacy, thereby harming America's standing in the world. President Obama’s spokesman, Josh Earnest, said that regarding negotiations over Iran’s nuclear program, congressional Republicans are “ready to fast-forward to the military approach before the diplomatic approach has been given the opportunity to succeed.” This is consistent with the pattern of foreign policy decisions the Republicans have made over the past two decades, he said. 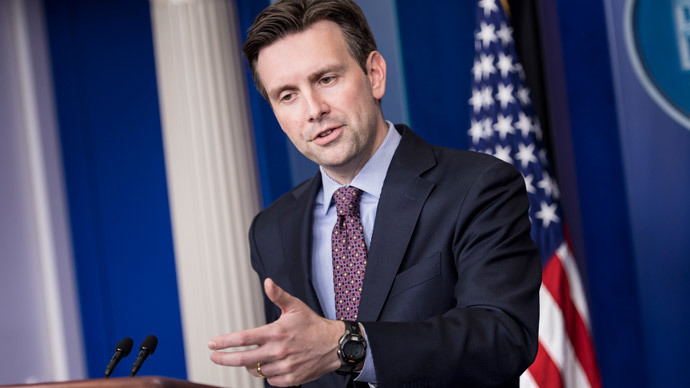 Earnest: "Efforts of neocons in previous administration" hurt America around the world. The White House spokesman disagreed that an agreement with Iran would have to be subject to ratification in Congress, citing several instances of international “commitments” to prove his point, including treaties with Japan and the Republic of Korea about the stationing of US troops there. However, he explained the administration’s view that Congress would have the final word on lifting the sanctions if and when Iran lived up to the deal. The Obama administration does not envision substantial sanctions relief until it sees a “demonstrated commitment” from Iran “for years” to accept “intrusive” inspections of nuclear facilities, factories, and uranium mines, Earnest said. If Iran somehow did not live up to the terms of the agreement, the White House would have a “full range of options on the table,” including the military option, he added.